The Universal Heart Network is the key way that Stephanie keeps in touch with readers. Monthly newsletters let you know about events, services, publications and news. The Network reflects the values that are at the heart of all Stephanie’s books, and in a special way, The Universal Heart, which inspired the founding of this Network. Simultaneously we can cultivate self-love, love for others and love for life itself. Energy and vision arise from this great trinity of experience. 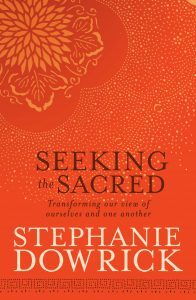 Through the Network, you can be among the first to hear when Stephanie announces a retreat, talk or workshop. – some of which are only made known in this way. She also sends out reflections on events, or from her monthly interfaith services. Whatever our background, culture or race, what rewards us most powerfully and consistently are the most deceptively simple abilities of all: the ability to be kind, to live enthusiastically and creatively, to appreciate and understand experiences different from our own, and to sustain a sense of inner stability and trust even in unwelcome and difficult situations. Looking around us, we can see how others also suffer – and may need our help. We can see that the seasons of suffering are often and quite incredibly followed by seasons of insight, increased wisdom and even joy. We can see that sometimes the suffering is of our own making – and it is we who must urgently and humbly make amends. We can see that help comes when we ask for it – but sometimes wearing strange disguises.